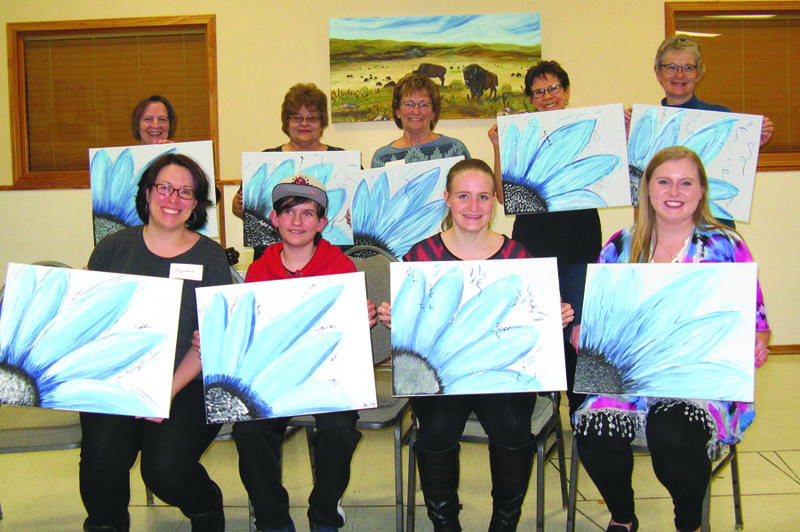 The Island Art Club held a Paint Nite at the Golden Age Centre in Bow Island on March 29. Twenty works of art were painted and were taken home by the people, while $430 was raised and went to the County of Forty Mile Food Bank, which was presented with the cheque on April 5. “It was an overwhelming success,” said Island Art Club president Carol Bergdahl. The decision to donate the funds to the food bank came after Paint Nite made extra cash after some uncertainty over whether they would be able to make money at the time, said Bergdahl. Each participant paid $30 and out of the fee, supplies were taken out of the fee. What was left over went to the food bank. Food bank president Rob Van Roessel accepted the cheque from the art club and said the money will go towards supplementing the weekly hampers that are given out to needy individuals and families. “Any donation is good because I think it justifies what we’re trying to do and the projects we’re undertaking and the food hampers that are being distributed,” he said. Paint Nite will be held next October.